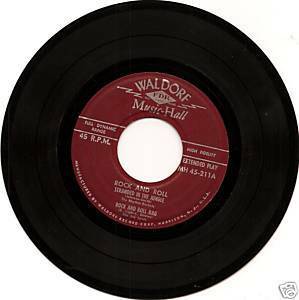 Waldorf Music Hall MH 45-211 vinyl EP (1956) Rock and Roll: Standed In the Jungle by The Rhythm Rockers/Rock and Roll Rag by The Ink Spots//I Want You, I Need You, I Love You by Slim Weston/Heartbreak Hotel by Bob Eberly with Enoch Light His Orchestra Condition is VG; come in plain white sleeve. Fascinating compilation of cover versions, under the supervivion of bandleader and label owner Enoch Light. Before you laugh off the idea of ex-Glenn Miller Bob Eberly warbler attempting Heartbreak Hotel (OK, he sings it as cluelessly as you'd expect), check out the guitar break which arguably is superior to Scotty Moore's on the Elvis original. And although Mr. Light himself co-authored Rock and Roll Rag, the Ink Spots really whoop it up, backed by authentic R B honking sax and electic guitar.